We’d love your help. Let us know what’s wrong with this preview of To Be Honest by S.M. James. Determined to either catch Scotty out, or take a shot at real love, Angus embarks on a summer road trip with his adorkable roommate Angus Reid is pretty sure he's being catfished. To ask other readers questions about To Be Honest, please sign up. First of all thanks to the author for providing an ARC for me to read and review! To Be Honest is the second book in the #lovehim series, but can be read as a standalone. I have to start off by saying that I love the cover of this book! It's different than most covers these days, but I love the drawing and the little details. Angus met Scotty on a forum a few months ago and felt an instant connection. He really wants to meet Scotty, but Scotty isn't ready. This makes Angus worried, is Scotty reall First of all thanks to the author for providing an ARC for me to read and review! Angus met Scotty on a forum a few months ago and felt an instant connection. He really wants to meet Scotty, but Scotty isn't ready. This makes Angus worried, is Scotty really who he says he is? I loved that the book took time to explain what catfishing is and the warning signs. This is a real thing these days and I think teens (and even adults) should be aware of the signs. Angus starts wondering if he really should feel the way he does for someone he met online, which is pretty understandable. 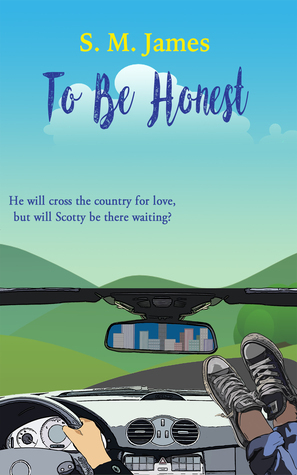 He really wants to find out if he's real, so a road trip seems like the perfect way to spend the summer and make his way to Scotty. He starts this trip with his best friend Anah and his roommate Tyler (his straight roommate who he's kind of had a crush on). I loved how real this road trip felt (yes, it's a bit unrealistic with a few of the kids being rich and having funds most teenagers won't have), but the tension and doubts all seemed real. Yes, they're friends, but things happen. During this journey, Angus starts becoming confused. Is Scotty real? What about his feelings for Tyler? To Be Honest (yes, I know it seems like a pun), I figured out how this was going to turn out about a third into this book. I can't get too much into detail, but I was happy to see how it ended, I was disappointed I already guessed. I loved the character development in this story. Angus is gay and proud of who he is, but realizes this isn't as easy as it seems. His best friend Anah is in a relationship that is in a vicious circle, what should she do? And then there's Tyler who has more going on than it seems! The chat messages between Scotty and Angus were fun to read along the way, I think it would've helped maybe a bit more to have had a few chapters from Scotty's POV. I love the grand gesture at the end and the fact that the story wasn't happily ever after within a few chapters. Would I read it again? : Of course! Wow! I barely know what to say. This series is...beautiful, charming, fun, romantic, and speaks to the hopeless romantic in me. Yet, it also manages to tackle real, everyday issues for teens, in a way that isn't preachy or condescending, or lecturing. Throughout the series, issues such as race, orientation, acceptance, bullying, and even self-awareness have been tackled without once feeling out of place. Despite the nearly 300 pages of each novel, I binge read each one in less than a day. That's how all-consuming they are, how engaging, and captivating the stories are. If you haven't read “No Big Deal” yet, then I suggest you do so quickly. It gives a little context, a little extra something to this novel that provides a deeper connection between Tyler and Angus, introducing us to how they met and how the catfishing concept started. And then go back and read book 1 “That Feeling When” and the short “In Real Life” because, trust me, you will not be sorry. I'm happy to say that I'm a series-reader, and I can't abide to read a series out of order, even if they are classed as standalones. So I started with “That Feeling When” and binge read all four stories in less than a week. I've only fallen more and more in love with the world that was created within this series with each story, and I can't wait until December 11th, when the next short “For the Win” is released. For me, “To Be Honest” is one of those books that you could read again and again and never not fall completely head over heels in love with each page, as you're reading. It's also one of those books that, once you know the meaning of the title, becomes all the more special for it. The fact that it added in spotlights of Archie's life, from book 1, was an added bonus. Despite having read his story first, I loved the contrast of seeing him pre- and post-Yarran, and how Angus reacted to that. Again, the presentation was on point. From the writing style to the visuals of chapter headings, to the added sub-chapter snippets of Angus and Scotty's chat conversations. Right from the start, I floved Tyler. He was so weird, so awkward, so nerdy, that it was just right up my alley. His weird dirt thing, the jokes, the weird places he wanted to visit – adorkable perfection, from one science geek to another! Angus, with his easy-breezy acceptance of the subtle homophobia at school, the way he opened up with Tyler, and his staunch support of Anah's inadvisable relationship with Link, just made him as loveable as Tyler. Here were two clueless guys circling each other, with no idea what was really going on. And then Scotty...God, Scotty was something else. Those long talks, the hesitations, the nerves, the fear. My heart bled for him the entire time. And, as a mystery buff I have to admit that I had my suspicions about the Scotty situation. Whether they really were a catfisher or not. If so, who they would be. My head went in a million different directions, a million different times, while reading, because although it was obvious, it also really wasn't obvious, and I sat on tenderhooks the entire time, trying to figure it out. It's one of those moments that, when the big reveal happens, you sit and go “Oh! Sure, I knew that!” but you questioned and second-guessed yourself every step of the way. I love the subtle way that each new character, for the next book, is introduced. I love that we always get to see even a tiny snippet of them and their personality, before we delve into their story. It makes me excited to see more of Darien, in December, now that I've had a glimpse of him in this book. The bonus chapter in Tyler's POV was just...perfection! I cried. It was ridiculously beautiful. I smiled nearly from start to finish, with some tears, some shocked gasps, some edge-of-the-seat tension in between. And then it ended just so...perfectly. That's the only word for it. It ended just as it was meant to. And I would still read another novel with these two as the MC's. Just as I would still read another novel with Archie and Yarran. Or all four in one novel. Or any combination the author wants to try. Because this is one series I'll be reading until the last story. And then I'll go back and start all over again, re-reading every sweet word. “So I kept my word. To Be Honest, that was my first mistake. I had the hardest time not skipping ahead to the end to see what the deal was with Scotty. But I refrained and read the book from beginning to end, no peeking, like the grown-up that I am. Scotty remains a mys Another wonderful coming of age story by S.M. James. I had the hardest time not skipping ahead to the end to see what the deal was with Scotty. But I refrained and read the book from beginning to end, no peeking, like the grown-up that I am. Scotty remains a mystery for most of the story, but looking for clues to find out more about him was super fun. TW: Homophobic slurs (not many, but there are still a few lines here and there), mentions of depression and suicide, mentions of attempted suicide and physical violence. To be Honest.. I really enjoyed this book! It was very different from 'That Feeling When', it was darker toward the end and it touched deeper aspects of being homosexual in a heteronormative world. At the same time, though, it managed to give me the same meet-cute vibes and I basically binged it in one day AH! (Who needs sleep anyway). Also, shout-out for diversity! Our main this time is half-Indian half-american and I think that's really cool because you don't see that often! Angus frequents Penbrook boarding school, he's part of the football team, and he's out and proud. Or at least, he thinks so. Even though he's out and his friends and teammates are okay with it, he's still unable to be himself 100% of the time, always feeling everyone's judging eyes in himself and unable to shake that feeling off. He also has a slight (huge) crush on his straight roommate Tyler. Tyler is what everyone would describe as a geek, he's into science, wears glasses and doesn't have a sporty bone in himself. And he's also very self-conscious about all of the above. The only one he is comfortable to be around and see his true self, is Angus, his best friend. And then there's Scotty, someone who Angus may very well be in love with, if it weren't for the fact that they've never met, and that Angus is starting to believe he's being catfished. To get to the point of this, Angus decides to embark on a log road trip, along with Tyler and his other r eat friend Anah, with San Francisco as his final destination, where he hopes to finally meet Scotty in person. During this roadtrip, Angus is faced with his feelings for Tyler and the always present feelings for Scotty, but he understand that he needs to take a decision on who is worth to keep in his life. I also liked Angus' talk with Archie! I think it was very well fused together with this story, and I liked that Archie could explain to Angus what it feels like to be scared of your own feelings and of yourself, because it gave him a different point of view of his story. S.M James reminded me of my love for YA books. Put this together with MM romance and I am hooked. I loved the first book, but this was an amazing read! I loved every bit of it. There's so much energy and emotions between the characters.I could feel their connection, and that means the world to me. I love the sweet moments, love the bonding, the getting-to-know-you. It has just the right pace, the right heat level. An amazing book that I highly recommend for anyone. FR- Alors alors.... alors j'avais déjà énooooooormément aimé le tome 1 et j'esperai que ça serai le cas pour celui ci également. J'étais un peu partagée à l'idée de ne pas retrouvée Archie et Yarran mais j'avais également hâte de rencontrer Angus et Scottie.. ou Tyler. Alors j'ai eu un peu peur, parce que je n'aime pas les triangles amoureux et je n'avais pas envie que ce roman en soit un et , désolée pour le spoil, mais ce n'est pas ça. J'ai énormément aimé ce tome également. Je me suis tout de FR- Alors alors.... alors j'avais déjà énooooooormément aimé le tome 1 et j'esperai que ça serai le cas pour celui ci également. J'étais un peu partagée à l'idée de ne pas retrouvée Archie et Yarran mais j'avais également hâte de rencontrer Angus et Scottie.. ou Tyler. Alors j'ai eu un peu peur, parce que je n'aime pas les triangles amoureux et je n'avais pas envie que ce roman en soit un et , désolée pour le spoil, mais ce n'est pas ça. J'ai énormément aimé ce tome également. Je me suis tout de suite attachée à Angus et j'avais envie de l'accompagner sur les routes des Etats Unis. J'ai beaucoup aimé ce road trip et découvrir les villes qu'ils traversent avec eux. J'ai également beaucoup aimé Tyler, qui est vraiment attachant et les échanges entre Scottie et Angus étaint super attachants et super mignons. Alors oui, je me suis demandée plusieurs fois avec qui j'aimerai voir finir Angus, oui j'ai espéré qu'il n'ait pas à choisir et oui, peut être que j'ai deviné la fin, mais ça n'a rien enlevé au plaisir de ma lecture, bien au contraire. Au delà du road trip, ce roman est un roman sur l'amitié, sur le fait de grandir, de se trouver en tant que personne et de s'accepter. J'ai énormément aimé les sujets qui sont abordés dans ce roman et j'ai beaucoup aimé le fait que même si Angus à l'impression d'être ouvertement out, ce n'est peut etre pas autant le cas qu'il le pense. J'ai aimé sa relation avec son père et ce que ce dernier fera pour lui à son retour de road trip. J'ai aimé également que l'histoire continue sur l'année scolaire suivante et bien entenu l'épilogue qui est parfaite à mon goût. En résumé, l'auteur réussit encore un superbe roman Young Adult comme je les aime, avec tous les éléments nécessaire à un bon roman de ce genre. ENG-So well well well... welll I had already loooooooooooooooooooooooooved the volume 1 and I hope that it will be the case for this one also. I was a little mixed up about not finding Archie and Yarran but I was also looking forward to meeting Angus and Scottie .. or Tyler. So I was a little scared, because I do not like love triangles and I did not want this novel to be one and, sorry for the spoil, but it's not that. I really liked this volume too. I immediately attached to Angus and I wanted to accompany him on the roads of the United States. I really liked this road trip and discover the cities they cross with them. I also really loved Tyler, who is really endearing and the exchanges between Scottie and Angus were super endearing and super cute. So yes, I asked myself several times with whom I would like to see finish Angus, yes I hoped he did not have to choose and yes, maybe I guessed the end, but it did not nothing removed to the pleasure of my reading, on the contrary. Beyond the road trip, this novel is a novel about friendship, growing up, finding oneself as a person and accepting oneself. I really liked the topics that are covered in this novel and I really liked the fact that even if Angus feels like he's out, maybe he does not think so much. . I liked his relationship with his father and what he will do for him on his return from the road trip. I also liked that the story continues on the next school year and well understands the epilogue which is perfect for my taste. In summary, the author still manages a superb novel Young Adult as I love them, with all the elements necessary for a good novel of this kind. All Angus ever wanted was a boyfriend of his own. Now he does have a sort of friend, Scotty, that he met online, but he refuses to meet or give him any personal information. This makes Angus wonder if he is being tricked. Yo make matters more complicated, Angus has a kind of crush on his nerdy, lovable, quirky roommate Tyler. To top the confusion of, Anah, Angus’s best friend is having problems with her on and off cheating boyfriend. And the solution to these problems ends up to be a road trip. Unfortunately, Anah invites her back on boyfriend who doesn’t have a filter when dealing with anyone different causing issues for Angus. This was a delightful and hilarious story about the difficulties coming to grips with many issues that young adults have. It is sad how some people refuse to accept anything that they consider is different making problems for those individuals. It was wonderful how on the trip Angus experienced that life in other parts of the country were more accepting as he saw his first Pride Day. Seeing people just being themselves was very liberating for Angus. It was sad how his feelings of confusion between Scotty and Tyler made him question himself, but there could be more to the situation than anyone ever expected. SM James writes these incredible books with these multifaceted characters that just speak to you from the first moment and don’t let go, even after you’ve turned the very last page. Her stories and the people who fill it up are so sweet, so cluelessly charming, so endearing, so real and so beautifully flawed. Angus, you are a contradiction of preconceived ideas - a kind, caring, sensitive jock – a boy finding a way to live his life on his terms in the world around him. Angus is ready to experienc SM James writes these incredible books with these multifaceted characters that just speak to you from the first moment and don’t let go, even after you’ve turned the very last page. Her stories and the people who fill it up are so sweet, so cluelessly charming, so endearing, so real and so beautifully flawed. Angus, you are a contradiction of preconceived ideas - a kind, caring, sensitive jock – a boy finding a way to live his life on his terms in the world around him. Angus is ready to experience real love and wants to much to meet his “someone”. He reminds me of a boy who is lonely in the midst of hundreds of people. I adore him. Tyler, you adorkable beautiful boy-man. A science geek with more cool points than he gives himself credit for and a heart, so much bigger than his body can easily hold. He is kind and considerate and such a loving best friend. Experiencing their lives and their emotions on this rather epic journey, through the words of SM James… my heart opened, bloomed, hurt, smiled bitter sweetly and eventually gave into the break. This story is so beautiful and if you really loved yourself (dramatic much?!? ), you’d get the book and indulge in this sweetly emotional read. I would not readily admit this to anyone, but between you and I, I cried actual tears at some points. Part coming of age drama and part YA romance, this is the story of Angus as he embarks on a cross country roadtrip to meet his online boyfriend. During the journey, Angus learns a great deal about himself, his friends and their relationships. This is a slow, introspective story. A scholarship kid at an expensive private school and a gay football player in a team of straight guys, Angus is used to being an outsider and it is onl I was given a copy of this book to read and review for Wicked Reads. The online conversations between Angus and Scotty are sweet but Scotty’s secrecy constantly ruins any potential for real intimacy between them. The friendship between Angus and Tyler left me equally uneasy. I guessed the plot twist in their relationship early on but like Angus, I was constantly torn between Tyler’s sensitive and almost romantic gestures and his moments of almost defensive heterosexuality. I like that Angus is strong enough to hold out for what he needs from a relationship but his caution doesn’t make for great romance. Ultimately, I found it was difficult to fully engage with the romance element of the story. I didn’t trust Scotty or Tyler and there was actually a point in the book when I just wanted Angus to enjoy an anonymous hookup. I’ve not read anything by this author before, but I was given the chance to read a copy for free before the book was published and as someone who likes YA and M/M books this seemed like a great book for me. It started off really well and I was hooked instantly, I loved the way the author broke the chapters up with the emails between Gus and Scotty. Unfortunately it went a bit down hill for me during the road trip - Anah really irritated me, basically the whole way through the book and I was glad when she wasn’t around. I think it was also during the road trip where I finally realised the truth of the whole story and was a tad disappointed with it if I’m honest. It all felt a bit predictable. I was then left with the rest of the story to get through and hope the outcome was somewhat worth it. I have to say it wasn’t a bad ending, I’m rather glad it wasn’t an instant fix but it also wasn’t a dramatic stretched out fix either and I think it’s sometimes hard to get the right balance. I liked getting to know Scotty through the emails and it was nice to get to know Angus but I think my huge bug bear was not getting anything (bar the last chapter) from Tyler’s point of view, duel points of view are a huge draw for me in a book and I’m unsure if you can really connect with both the characters when it’s just told from one persons point of view. I enjoyed the book overall though and I’m definitely interested in looking into the other LGBTQ books this author has written. The imagery the author used by quoting first person chat messages to tell the characters story was captivating which made story very unique, and interesting. To Be Honest by SM James is a coming of age story of a gay teenage boy that starts off with an attention getting conversation of an online chat session between two people far apart by distance but close together spiritually by sharing similar situational life experiences. The author’s first person portrayal of the main character Angus in op The imagery the author used by quoting first person chat messages to tell the characters story was captivating which made story very unique, and interesting. To Be Honest by SM James is a coming of age story of a gay teenage boy that starts off with an attention getting conversation of an online chat session between two people far apart by distance but close together spiritually by sharing similar situational life experiences. The author’s first person portrayal of the main character Angus in opening chapter had me entertained and intrigued reading at a break neck pace to find out what happens next! This book has well written characters with very believable human needs and flaws. The storyline tackles very important coming of age topics which include first crush, first love, teenage angst, in both gay and straight relationships, as well as how to navigate online dating relationships. Through clever and effective imagery the writer brings the reader into a story that has Angus wondering if his online chat “boyfriend” is real of just catfishing him. This book is a great read for anyone who has had to deal with wondering if the person on the other end of the text, chat, email, or dating Ap is really who they say they are. I especially recommend it for teenagers who are just starting to cross the divide between childhood and adulthood, because it will help them realize that gay or straight, everyone is just looking to be loved and valued for who they are. The thing I loved most about this book was the writing, Angus Reid is not your typical high school jock. Yes he plays football, but his out and proud. Everyone at his private bording school adores him, but Angus hasn't found love. Not exactly. This is an epic cross county journey of finding love & what better way to do that then with the people that mean everything. There will be drama, there will be passion, but will his online friend be the man he needs or is Angus indeed being catfished. To Be Honest is a lighthearted YA romance with lots of teen drama thrown in. Angus Reid goes on a road trip with his roommate and crush Tyler, best friend Anah, and her boyfriend Link. The goal is to visit San Francisco along the way to confront Scotty, Angus' online friend and other crush, who has been adamant he is not ready to meet irl. I really enjoy road trip stories, and this one was great! I just loved the characters and all the d I received this book for free through Voracious Readers Only. I really enjoy road trip stories, and this one was great! I just loved the characters and all the different places they went. I loved this book! Angus was a wonderful main character, with realistic wishes and dreams. He had good friends and a supportive father. I loved that his boarding school classmates didn't treat him differently because he wasn't rich or because he was gay. Angus was torn between his feelings for his straight roommate Tyler and his online friend Scotty. Tyler's mixed messages kept Angus infatuated and confused, which had the potential to mess up a future he might have with Scotty. A road trip teste I loved this book! Angus was a wonderful main character, with realistic wishes and dreams. He had good friends and a supportive father. I loved that his boarding school classmates didn't treat him differently because he wasn't rich or because he was gay. Angus was torn between his feelings for his straight roommate Tyler and his online friend Scotty. Tyler's mixed messages kept Angus infatuated and confused, which had the potential to mess up a future he might have with Scotty. A road trip tested friendships and trust, and it eventually brought about a major revelation. I wasn't at all surprised by the twist in the story, but I was still glued to the book until the end. Angus and Tyler are roommates, friends, and co-road-trippers. Their friend Anah and her boyfriend round out the gang. Reason for road trip-to meet Angus’ online crush, Scotty, who won’t tell Angus who he is. Although it’s obvious throughout, its sweet what Angus notices about Tyler, how they’re drawn together. The heavy parts are unfortunately true to life, and hopefully, the tragedy of homophobia disappears with each passing year in our world, but not likely that fast. Anah is a bit immature, a Angus and Tyler are roommates, friends, and co-road-trippers. Their friend Anah and her boyfriend round out the gang. Reason for road trip-to meet Angus’ online crush, Scotty, who won’t tell Angus who he is. Anah is a bit immature, and I wish they were students in university because it would sound less far fetched that they go on this trip. I do get why this age was chosen, so I can put it down to author’s inclination. Interesting book, lots of fun parts mixed in with high school drama and a dose of reality. "To be Honest" is the second book in the #lovehim series. It can be read as standalone, however it has a wonderfull short prequel ("No Big Deal") that introduces the characters very nicely and gives a lot of inside about the feelings and motivations behind Angus and Tyler, i would absolutely suggest everyone to read beforehand. The title of this book is absolutely fitting, its about being honest and finding one self, and to honestly open up to others and accepting others and oneself just the way "To be Honest" is the second book in the #lovehim series. It can be read as standalone, however it has a wonderfull short prequel ("No Big Deal") that introduces the characters very nicely and gives a lot of inside about the feelings and motivations behind Angus and Tyler, i would absolutely suggest everyone to read beforehand. The title of this book is absolutely fitting, its about being honest and finding one self, and to honestly open up to others and accepting others and oneself just the way you/they are. Tyler and Angus are adorable together. I love their connection... the interactions between them speaks of intimacy and love, even when just friends. The journey they take, both physically and emotionally, is fun, emotional and absolutely perfect. It's a story of embracing your chance at love, learning to love and doing what it takes to keep your love no matter what others may think. I guessed the ending right from the start, which was a bit disappointing. I was kind of hoping for the author to prove me wrong, but it didn't happen. Although predictable, this story drew me in from the very first page and I had a hard time putt I guessed the ending right from the start, which was a bit disappointing. I was kind of hoping for the author to prove me wrong, but it didn't happen. I didn't quite expect how quickly this book drew me in. The characters were heartwarming, flawed, quirky, and unique, and the writing flowed so well I just wanted to keep reading. Angus' journey around the States feels grounded in the locations he visits, and the dialogue (and messages) add a wonderful flavour to the whole road trip. This is the kind of book you stay up late to finish. Definitely recommend this read! This was a cute YA story. I don't think I'd let 4 17yrs old on a cross country adventure however guess when you go to boarding school, maturity is different. I love how the author portrays the 2 main characters with their different life events and thoughts in regards to their sexuality. We see them struggle separately but also together but even when things blow up and decisions have to be made, love conquers all and finds a way. As Addictive as the previous #lovehim novels. Its really easy to fall in love with the characters and it leaves you wanting more! It’s basically the teen movie you always love watching over and over with gay characters! I really recommend it if you are looking for a fun read, amazing characters and a romance sprinkled with glitter and dust! This is a very sweet story. It contains love, friendship, confusion and a road trip. Its a little too fairy tale romance for me, but that’s just my personal preference for darker grittier stories. I would recommend this book for a younger reader, high school age students would be the perfect audience. I received a complimentary copy from VRO in return for an honest review. This review has been hidden because it contains spoilers. To view it, click here. From the start I had this feeling Tyler was Scotty, but then Angus got messages while they were roadtripping and in my mind it didn't add up. I love the reason why Tyler acted like he did. He had some very serious reasons to do so. And cheers for the football team for being great guys. It was quite cliche but still sweet. Sometimes too sweet. 2.5 stars. This was really, really cute! I just love Angus and Tyler even if Tyler messed up. And the ending was absolutely perfect! I want more!